The story of a woman struggling to overcome the ghosts of her past, The Dark Holds No Terrors explores some fundamental issues faced by women. The darkness that has the capacity to stir up fears and anxieties need not be just outside, it need not be just a lack of light. It can also be darkness inside the mind, confusions and disappointments, and old unhappy memories. This is the kind of darkness that the protagonist, Sarita, of The Dark Holds No Terrors faces. The shadows of her past and the uncertainties of her present shake her own faith in herself, in her perspective of herself as an individual, as a mother, as a daughter. Sarita was born to orthodox parents, and her mother especially was hard in her views. She wanted a son. But, her first child chanced to be a daughter, Sarita. The mother blamed Sarita for being born a girl, for being born before her time, and for being weak. She fills the child’s mind with guilt at these ideas, even manages to sow enough doubts to affect the young girl’s performance at school. Later, Sarita’s parents have a son, but an unhappy accident results in his early death. Dhruva was very attached to his sister, and he followed her wherever she went. It was when he was with her that he accidentally dies. The mother bitterly blames Sarita for her son’s death, and makes her feel guilty all the years she is with her. Sarita finishes her medical studies, falls in love with a writer, and marries him in opposition to her parent’s wishes and leaves home. Losing touch with them for years, she returns home to visit her father on hearing of her mother’s death. Her present life is not happy either, as her husband has turned bitter because of his failure to gain recognition in his field, while his wife prospered in her profession. The Dark Holds No Terrors explores some of the fundamental issues faced by women. Sarita’s troubles are caused by having grown up in a very conservative family, especially by having a mother who was entirely unsympathetic and narrow in her views towards her daughter. 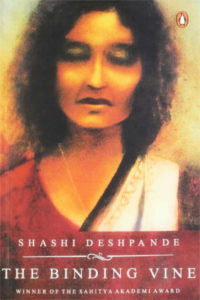 Shashi Deshpande is an award winning author. Other books by Deshpande – If I Die Today, That Long Silence, Come Up and Be Dead, The Binding Vine, and The Intrusion and Other Stories. She has written short stories, children’s books, and nine novels. She was born in 1938 in Dharwad Karnataka. Her father was the famous Kannada writer Sriranga. She did her final years of school studies in Mumbai, and earned a degree in Economics and then earned a degree in law, in Bangalore. She did a course in Journalism and worked for a very short time for a magazine called Onlooker. She then started to concentrate on writing fiction. Her first short stories collection came out in 1978. Her first full length novel was The Dark Hold No Terrors. Her book, The Long Silence earned her a Sahitya Akademi Award. She has also been awarded the Padma Shri.